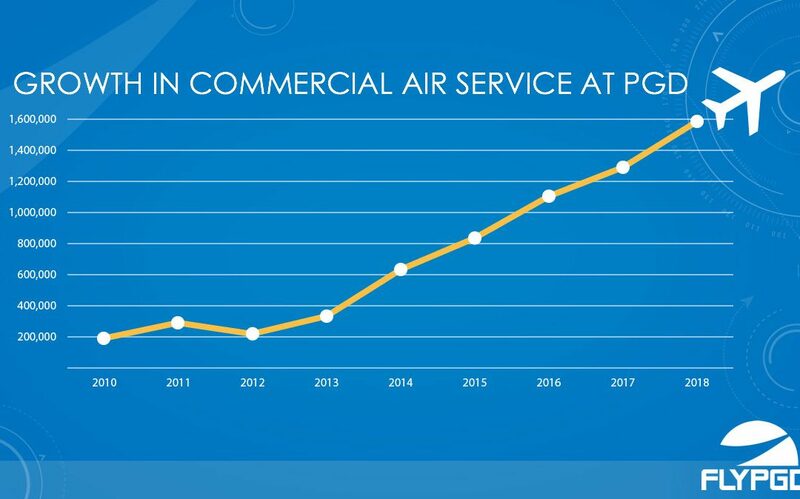 As domestic and international air travel continues to boom, Punta Gorda Airport (PGD) is an increasingly valuable asset. In its “Aerospace Forecast Report Fiscal Years 2017 to 2037,” the Federal Aviation Administration (FAA) projects sustained and continued growth in nearly every aspect of air transportation, from general aviation private flying to large commercial airlines. That’s why it’s good to know PGD continues to reach new heights, year after year. It’s a vital economic engine in Charlotte County. March 2018 was the busiest month in airport history. PGD has enjoyed record growth for three consecutive years, now serving nearly 1.6 million passengers annually. The airport was transformed by a $9 million terminal expansion in 2016, the same year it was named “Commercial Airport of the Year” by the Florida Department of Transportation (FDOT). With its partnership with Allegiant Airlines, PGD has emerged as a low-cost fare driver in our region, offering the second-lowest one-way fares in Florida. But this success doesn’t happen by chance. It takes solid leadership and forward thinking to keep our airport growing. Punta Gorda Airport is owned and managed by the Charlotte County Airport Authority. It’s an independent, special district enabled by the State of Florida Legislature that is 100% self-sufficient. In other words, PGD does not use a single dime of Charlotte County taxpayer money to fund or subsidize operations. The Airport Authority is led by CEO James Parish and overseen by five elected commissioners serving four-year terms. They’re responsible for overseeing a strategic, master plan that spans twenty years. A staff of 85 provides daily, hands-on management. Want more proof of solid management? PGD operates with about $10 million in cash reserves on hand. Every day, approximately 500 full-time employees report to work at the airport, with an additional 1,700+ jobs in Charlotte County supported by its operations. PGD is home to a bustling mix of passengers, a major airline, flight schools, rental car companies, restaurant and concession operators and dozens of aviation and non-aviation related companies. Two lighted runways accommodate 220+ daily flight operations for 400+ aircraft, from single engine to new Airbus jets. About 75% of airport income is airline-related and includes fees from Allegiant, passengers, parking, rental cars and concessions. Hangar rentals, fuel sales and business tenants comprise the other 25% of airport income. On-site businesses include distribution, light manufacturing, aerospace and avionics, flight schools, charter companies and private pilots. The airport is a hub for Allegiant Airlines and home for its fleet of new Airbus A320 jets. Allegiant flies to around 40 destinations with some of the lowest fares in Florida. New construction (and new revenue) is on the horizon, including a new general aviation terminal and restaurant; runway extensions and rehabilitations; and improved roadways and taxiways. Longer-term projects may include parking and passenger terminal expansions. Punta Gorda Airport sits within 4,300-acre Interstate Airport Park. Shovel-ready sites are available up to 150 acres. Whether leasing on-airport property or purchasing adjacent land, the Park is a great home for aviation, manufacturing and distribution companies. The business advantages are numerous. It’s adjacent to I-75. It’s a Foreign Trade Zone (FTZ) with ample water, power and telecommunications infrastructure. A major 2018 grant from the state of Florida will fund infrastructure and a new entrance to PGD and Interstate Airport Park on Piper Road North, creating thousands of potential job opportunities (read about a bigger state grant in article #3). With proven leadership, solid management and plans for future growth, Punta Gorda Airport will continue to reach new heights, and it looks like the sky’s the limit.